Spoilers, under appropriate tags, will be included in a separate post. This post is spoiler-free so that I can link back to it for people who don’t want to know any of the plot. This is a must-see for fans of the Gundam 00 series. If you haven’t seen any of the show, or much of it, you can still enjoy it as a movie, but the movie does not stop to hold your hand and explain who characters are (beyond pointing us at the main character) and what their relationships to each other are. This movie has spectacular visuals. If you have a large HDTV and want to make it sing, get this on Blu-Ray when you can and feel your optic receptors explode. The battles are very visually intense. Judged purely by visual hedonism, this movie is 10 of 10. The theme – again, without spoilers about how it ends – is first contact with an alien species. As such, it is best approached as more traditional science fiction that just happens to have giant robots (Gundams) in it, rather than dwell on it being a “Gundam” anime. 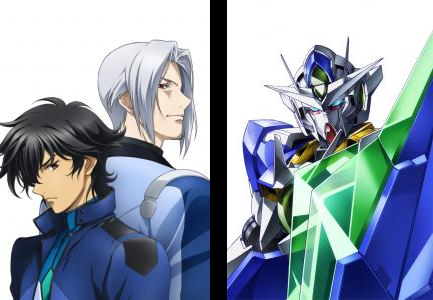 Now, to be completely honest, I always found Gundam 00 to be very predictable in overall plot, however ornate its handling of technical details (minor and major). The movie is no different. The movie retains the series’ penchant for over-wrought dialog, but that’s the nature of the beast. In its favor, the movie has a minimum of human beings acting like jerks, largely thanks to the single unifying threat in the show. Running time: 2 Hours (120 minutes). Bring extra popcorn. It is what it is. If you’re into Gundam 00, or into the sci-fi genre, watch it, enjoy it for what it is, and sit back and enjoy the pretty colors. This entry was posted in Anime, Art, Culture, Japan, Movies and tagged 00, art, culture, film, Gundam, Gundam 00, movie, non-spoiler, review, theatrical. Bookmark the permalink. Now that we have a MG 1 1 00 Wing Gundam what should I do with my HG 1 100 from fifteen years ago?